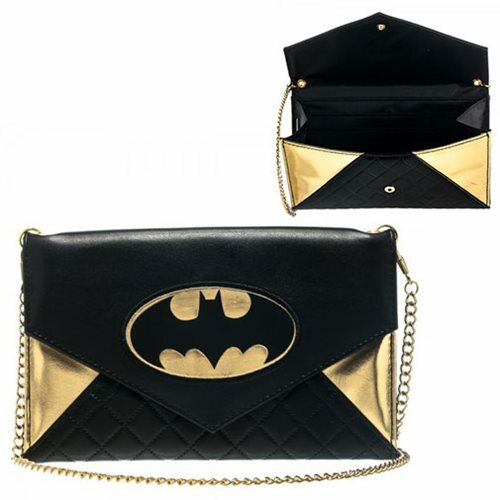 Carry Batman with style with this Batman Gold Logo Envelope Wallet Clutch with Chain. Perfect for on the go, this handy envelope clutch features Batman's iconic golden logo and features a quilted design on the clutch itself! Cute and convenient, this clutch comes with a golden, linked chain for on the shoulder or across your body. Measures about 4 1/2-inches tall x 7 1/2-inches long and chain is approximately 48-inches long. Features 1 big pocket for cash and 6 credit card slots. Ages 14 and up.